Most cemeteries are spooky but the Old Jewish Cemetery in Prague is in a league all its own. Each October AESU likes to explore the strange sides of well-known, destination cities. This October we kick off our Halloween blog miniseries with Prague. 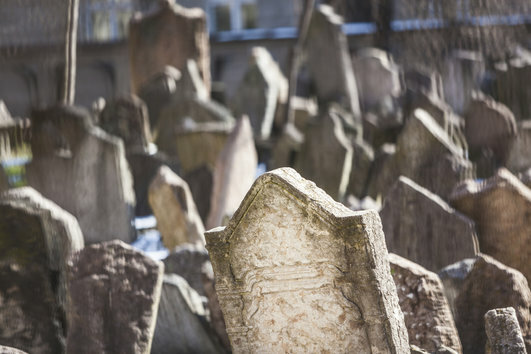 Most cemeteries are spooky but the Old Jewish Cemetery in Prague is in a league all its own. No one knows when exactly the Old Jewish Cemetery was founded but some scholars think it could date all the way back to the 1300s. The age of the tombstones certainly lends to the creepiness of the cemetery but it’s the incredible quantity of gravestones that gives the Old Jewish Cemetery its spooky vibe. The weathered tombstones are essentially stacked on top of each other, leaving almost no room to maneuver between them. This is because Jewish religious laws forbid moving tombs away from their original site. Over the years, when new people needed to be buried here, more dirt was spread in the cemetery and the new caskets were buried directly on top of the existing graves. Now there are 12 layers of graves in the cemetery’s plot. The strangeness surrounding the cemetery doesn’t stop there. Conspiracy theories state that the Old Jewish Cemetery was the meeting place for a secret society that aimed to take over the world. This theory and the book describing it, The Protocols of the Elders of Zion, proved to be an elaborate, anti-Semitic hoax. But the fact that the authors chose the Old Jewish Cemetery as the secret meeting location is a testimony to this location’s eeriness. The theme of over-crowded burial places continues outside of Prague in the Sedlec Ossuary. The Sedlec Ossuary, aka the bone church, was founded in 1142 and is now home to some of the world’s most morbid art. The Ossuary is decorated with the bones of 40,000 people that have been arranged into striking adornments like skull candelabras, enormous bone pyramids and chandeliers made with every bone found in the human body. To complete the shocking look, several bone chains are festively draped around the place like party streamers. But why would anyone decorate a monastery with human bones? The answer is rooted in the Monastery’s enduring popularity. Sometime in the 13th century, the monastery’s Abbot went on a pilgrimage to Jerusalem and brought back a handful of dirt. He sprinkled it in the cemetery and that thin layer of holy dirt established the Sedlec Monastery as the most desirable place to be buried in central Europe. In the subsequent centuries the church’s cemetery became overrun with some 30,000 bodies. In response the monks created the Ossuary to store the bones of the deceased. By 1870 the number of bodies in the Ossuary had grown to over 40,000 and the monks came up the novel (read strange) idea of using the remains as decorations. So while you’re in Prague go visit the Sedlec Ossuary and the old Jewish Cemetery and learn some history while getting in touch with your gruesome side! Want to Explore the Spooky Side of Prague? AESU offers unique, exciting travel programs for college students and young professionals at affordable rates. Each trip is action-packed and informal – designed for people your own age. We are also able to design custom tours just for your group. If you have any questions or want help booking a spooky, fun-filled, and, perhaps most importantly, affordable trip to Prague, please contact AESU by calling 800-638-7640 or fill out the contact form found on our website. This entry was posted on Thursday, October 1st, 2015	at 2:37 pm	. You can follow any responses to this entry through the RSS 2.0	feed. Both comments and pings are currently closed.